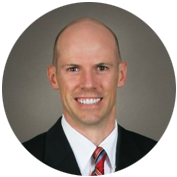 After earning a Bachelor of Science from the University of Utah, Dr. Dutson attended Southern California College of Optometry where he received his Doctorate of Optometry with honors. Dr. Dutson is an associate professor for the Pacific University College of Optometry and has been a member of the American Optometric Association since 1998. He has published at the American Academy of Optometry, owned and operated a private practice, been clinic director and regional optometric trainer for a national surgical company, and helped thousands of people see better following vision correction procedures. Dr. Dutson and his wife, Natalie, are the parents of three children.